The next three posts present an overview of what stakeholders in Santa Barbara County need to know to homestead and steward the new regulatory water environment. 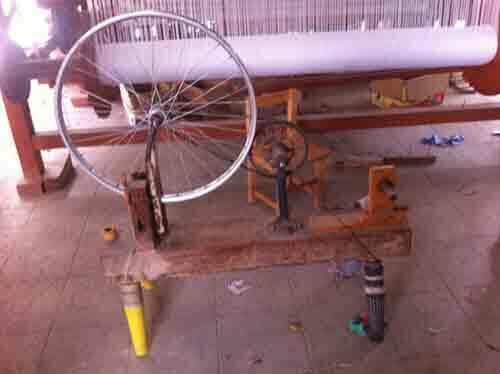 Humans are resourceful, from the most trivial quick fix/substitution-work-around-make-do bricolage to history-changing creativity and art. Trivial challenges tend to be met by working improvisationally with whatever is at hand; we all do it. Traveling in Asia and Africa during the sixties and seventies, I used Rémy Martin cognac (40 % alcohol) to brush my teeth to minimize threats of water bacteria I had not adapted to. This was an effective workaround for at least 20 years: one very palatable “clean” liquid substituted in a necessary and usual practice for the usual liquid (tap water of US-standard cleanliness) with relatively little cost or effort (Remy Martin was easily accessed at tax-free airport gift shops at small cost). This particular work-around no longer works, for several reasons. Remy Martin has become costly over the period of 1963 to 2015 and is no longer a viable substitute for washing and cleaning. Ultimately, Remy Martin depends on the default of water for growing grapes in a process that double-distills white wine produced from grapes grown in Cognac, France, requiring a rough average of 720 liters to one liter of cognac (using the Water Network statistics for wine's water footprint). What will Remy Martin do when water becomes too costly to create cognac? Water, the universal default for all liquids, is also becoming costly and clean water has become scarce.What will we do when neither Remy Martin nor water is a viable alternative for keeping our teeth clean? In 2015 we face a problem no species has ever effectively addressed in recorded history: clean easily accessed water is becoming scarce worldwide. Providing food, drink, and sanitation to over 7 billion people has unbalanced the “water supply equals water demand” equation. Consider: wine cannot be substituted for water when water becomes scarce and costly. Listerine cannot be substituted for water because it is mostly water and alcohol, which is also water-based. 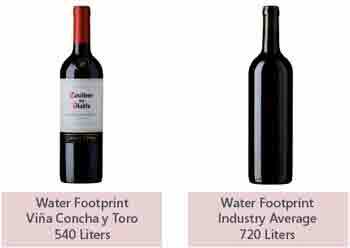 Wine’s water footprint, as referenced in the last post in this series, as calculated by the gold standard the Water Footprint Network (based in the Netherlands) and broadly publicized by Latin America’s largest wine exporter Concha y Toro averages720 liters of water per 750 ml bottle of wine. Concha Y Toro, with a smaller footprint, is a wine company committed to water stewardship, so most vineyards are drip irrigated, but under extended drought the water sources for drip irrigation could become depleted. Water footprints represent the water required throughout the life cycle of a product or person in a specific place and time. The tools used for calculation reflect the frameworks and concepts of those who designed the calculators and methodologies, so the products evaluated by one system should be used with caution when comparing with outcomes from a different system. Water use, which corresponds more closely to what would be metered on a water bill or well, is different from water footprint and should not be compared; the latter considers evapotranspiration, soil moisture, rain, as well as how much water is required to bring waste water associated with the whole life cycle of the wine process up to ambient standards. The drought has heightened interest in dry-farming as a solution to water scarcity, but this would have an insignificant effect on overall water use. Dry farming crops still requires water, both as rain (usually at least 12 inches) and groundwater, which is frequently found at considerable depth, sometimes more than 100 feet, which would mean roots of any When groundwater itself is a resource already being overdrafted, tapping into this threatened source of water is not necessarily the solution. Central Valley and some Central Coast farmers have responded to falling groundwater levels by digging down deeper. Research at UC Davis on grapes dry-farmed and grapes farmed with rain and irrigation in the Carneros Region indicated that the dry-farmed vines yielded 4.9 tons per acre and required 14.2 gallons of soil-sourced water to produce a 4-oz glass of wine (5 glasses to a 750ml bottle) , while the irrigated vines, yielded 6.3 tons per acre and required 15.3 gallons for a 4-oz glass of wine, using about half from rain and soil and half from irrigation. The ration of water to wine, from a water shortage perspective, is not sustainable, regardless of wine's influential position as second leading revenue-generating commodity in California. The fact that the water-footprints of the other top ranking commodities, i.e., almond, milk, strawberries, lettuce, and avocados, are larger than wine's doesn't change the unsustainability of all of these products, although each industry is bound to have powerful lobbies to influence in their favor the brand-new water-regulatory environment. Some farmers have already adapted by moving grazing lands out of the County, cutting down trees--especially avocados, or letting fields go fallow. Most strategize action for long-term survival. Their plays are already in place; for the average stakeholder to join the game, knowledge, skills, and a strategy need to be acquired. The wine industry is the focus of this post series not for attributing blame but for a solution-oriented reason. Wine and particularly premium wineries have defacto leadership positions in many communities and are good candidates for leadership in the water stewardship niche. California ultrapremium winery owners and winemakers tend to be masterful mavericks with most of the skills, knowledge, and ethics to bricolage a water stewardship niche,occupy it, and develop it. More than 1,200 wineries in the state, ranging from small boutique, family-style wineries to large corporations like E & J Gallo Winery, together harvest about 4 million tons of grapes per year. An estimated 90 % of California vineyards are irrigated, Using averaging statistics for winegrowing and inferring production of grapes into wine, about 756 bottles of wine are produced from a ton of grapes. Doing the math, 756 bottles of wine per ton of grapes requires 720 liters of water x 756 bottles per ton, or 544,320 liters of water are required per ton of wine-grapes eventually embodied in wine. Four million tons of wine-grapes harvested and bottled indicate a final embodiment of 4 million x 544,320, or 2,17, 280 liters of water. Data from 2012 indicate that 58,000 active vineyard acres support about 280 wineries in the Southern Planning Area (12 Southernmost counties including Tribal Territories). Given that almost all of California is experiencing historic drought and depleted supplies, where will this water come from? 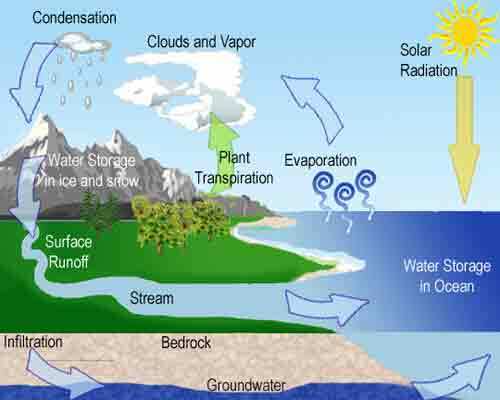 The water cycle suggests that water is eternal, but fails to indicate that clean water is not. As water cycles through the air and ground it picks up dirt, radiation, and chemicals that cannot be readily cleaned within or without this cycle. At first blush, no good substitute comes to mind for clean water. Nor second or third. While bricoleurs--in the US referred to as do-it-yourselfers-- are good at work-arounds, working around requires working on the project. An identified but scantily occupied niche is that of global steward. The rest of this post and the next few are devoted to how stakeholders can occupy this niche, starting with water stewardship. On the water planet there is likely no substitute for water but there are alternative ways to participate in this cycle. Bricoleurs, as indicated in the top image, use whatever is at hand or in the environment to get done whatever project or problem is tackled. As new problems and challenges arise, the original project transitions to a brand-new project, making whatever is at hand an environment with unexplored resources. The bricolage project considered here is the creation of a water stewardship niche. Bricoleurs by definition creatively manipulate objects to suit the task at hand. Given the crisis, creativity is a survival requirement for the next 25 years, at the least. Stakeholders who hope to successfully occupy the 2015 stewardship niche, not unlike those who wish to become US citizens, need to meet key requirements. Stewards should be able to navigate unexplored territories, implying improvisation; paying attention, they will gain knowledge of each habitat: who dwells there, who are the alpha player and predators; what are the issues of major concern; what are the subtexts; how do things work in this niche--the good guys and the bad guys (predators)--who stands to gain and who to lose according to which policies and practices, who has the power to get things done, how and why and what; strategies likely to achieve goals of each player; the system outcomes and inputs. Niche occupation in 2015 requires cognitive and improvisational skill as well as information that evolves. Robinson Crusoe, for example, could be considered a master bricoleur, whose goal was survival; not only did he make do with whatever was at hand, he thrived on his own ingenuity and resourcefulness. Bricoleurs as mentioned above solve problems by thinking creatively about whatever is at hand, which in the new groundwater regulatory environment implies that a rule is only a provisional guide, and legacies and grandfather clauses need to be continuously re-evaluated. The next post considers approaches to this environment. identifying and/or creating an unoccupied niche and inhabit it. In the case of Homo sapiens, the last one seems like the best option, from the perspective of most likely to succeed. The Big Picture: we depend on rain falling somewhere and transport systems to deliver water from water-rich areas to water-poor ones. When the water-rich regions dry up, we are at a loss for fresh sources. 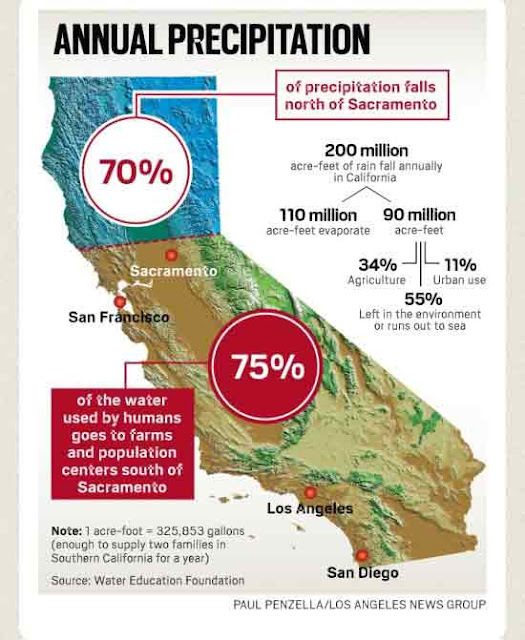 In Central California 1.53 million people depend for 83% of their water supply on groundwater. Groundwater is considered worldwide as the water resource of last resort. Transport resources such as the State Water Project and Central Valley Project are under major stress. Local water resources are also overdrafting groundwater, but in many areas such as the Central Valley, the waiting lists to dig new wells to tap into groundwater are a year long. It could be up to us to create a viable work-around. Tulare farmers and homeowners drilled 796 new wells in the first nine months of 2014. Two-thirds of the wells permitted were granted to farmers for crop irrigation. Fresno County has some of the highest drilling activity in the region, with a steady uptick in agricultural and private domestic wells drilled since 2011. Agricultural wells in 2014 have already surpassed the number drilled last year, and is more than three times the number drilled in 2011. 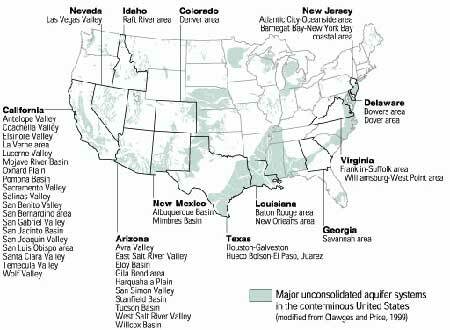 The Central Valley aquifer is California's largest aquifer, recharging slowly for the past 20,000 years. Most of the more than 100,000 wells that pierce the valley floor are unmetered and landowners have taken what they wanted for irrigation for at least 100 years. According to the LATimes, "Scientists estimate that since the first wells were drilled by settlers more than a century ago, pumping has depleted Central Valley groundwater reserves by 125 million acre-feet." In some systems, when large amounts of water are pumped, the subsoil compacts, thus reducing in size and number the open pore spaces in the soil the previously held water. This can result in a permanent reduction in the total storage capacity of the aquifer system. Land subsidence occurs when large amounts of groundwater have been withdrawn from certain types of rocks, such as fine-grained sediments. The water is partly responsible for holding the ground up, so when withdrawn, the rocks falls in on itself.Groundwater levels have been dropping rapidly in the Paso Robles subbasin in recent years. Four areas of subsidence have been noted in the Paso Robles region. Water resides in three places on earth, categorized as: surface water on the surface in lakes, streams, reservoirs, ice, snow, and permafrost; atmospheric , and under ground, categorized as soil moisture and groundwater. Normally, water users get their water from the sky, via from wells, reservoirs, and city, state or federal water-supply systems. Under extended drought conditions, surface waters dry up, dams and reservoirs become depleted, wells can no longer draw from groundwater with water table levels dropped too far, and people worldwide tap into deep, non-renewable ground-water stores. Partly because this resource is out of sight, it has been largely unregulated worldwide. Because it has been unregulated and unmanaged, it has been exploited. The Santa Barbara County/Central Coast Region is conceptual. That means it can be reconceptualized as we go. The landscape is categorized as Mediterranean, largely arid, with less than 20 inches of rain in a few months only. Most likely, under conditions of unpredictable Climate Change, this too will be reconceptualized. The next post approaches key water concepts as an improvisational landscape with water facts such as surface water supply, hydrologic units, annual rainfall, groundwater regulations, all treated as evolvable tools for the project at hand.